Painting cabinets is a great way of revamping the look of your entire kitchen. Better yet, this is a viable DIY project you can do without any issues. However, painting kitchen cabinets takes much more than just picking a color and getting down to work. You need to consider a lot of factors but sadly, a lot of homeowners don’t often pay attention to this. There’s no doubt painting kitchen cabinets can have a massive impact on how your kitchen looks, but keep your expectations at ground level. If the cabinets are not new, there’s every chance they may have experienced some wear and tear over the years. The paint will not make this go away. Even though it will help hide them a little bit, they will still be there. Besides, the effects of painting are more visible when the paint has fully dried. This may take a few days so don’t just paint and expect instant results. Anyone who has any experience with DIY projects knows just how important cleaning is. Don’t just paint when you feel like it - if you want the coat to have the best effect on the cabinets, you will have to clean up the wood first. Remove old paint, dirt, and other debris before smoothening out the surface to be painted. Let it dry before you start painting. This will make it easier for the paint coat to hold and the effects will be clearly visible in the end. A lot of people out there definitely agree that painting is more of an art than a simple job. Calling it art is perhaps a stretch but then again, it’s something that needs to be done with a lot of care. In that case, you may want to take your time. Each stroke of the brush needs to be savored. Rushing your way through the job can really affect the quality. It’s very likely that you will end up with uneven coats of paint that look terrible. Just take your time and paint as carefully as you can and everything will be okay. It goes without saying that the effectiveness of a paint job on kitchen cabinets will totally be determined by the color you have chosen. The options are endless but it’s also important to truly understand what you’re looking for because colors are incredibly subjective. After all, different people have different tastes and this is actually the reason why there’s no right or wrong color when it comes to painting. The most important thing is to make the cabinets complimentary to the existing paint colors in the kitchen already. 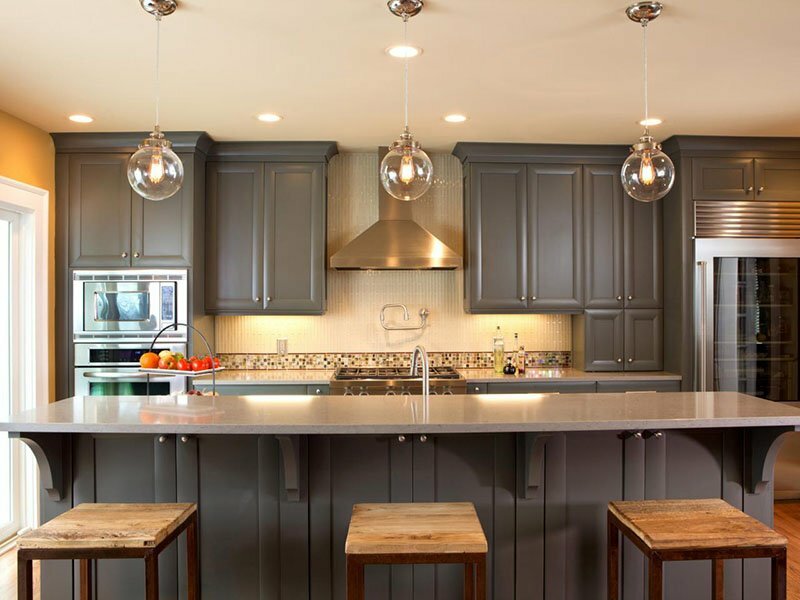 Cabinets can also offer great accent value if the color is chosen right. This is probably one of those one-off projects that you don’t have to redo over and over again. It’s recommended to get the colors right before doing anything. If you want your cabinets to sparkle under the glamour of paint then you have to invest in quality products. Buying the cheapest paint in the market may save you a few bucks but in the long term, it will cost you a lot. Besides, high-quality paint is not that expensive, you can easily afford it if you want. Painting cabinets can deliver a newfound beauty for your entire kitchen. Although there are many factors to consider while doing this DIY project, the most important thing is to always try to avoid common mistakes and the ones above are just the main ones.